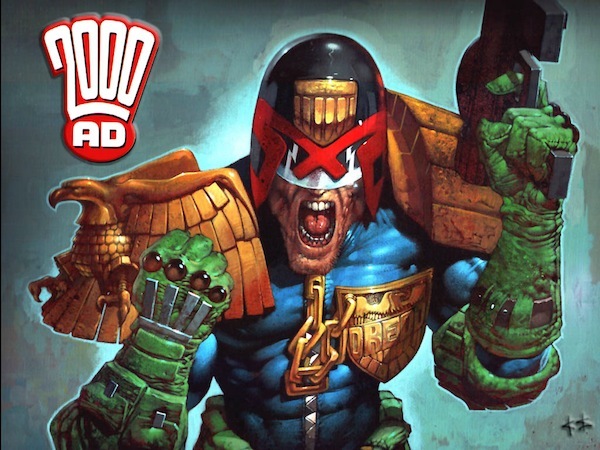 Judge Dredd, according to Wikipedia, is an immensely successful comic, running since 1977 in the British anthology 2000 AD. Yet the character and the series has never quite caught on over here in the U.S. Perhaps it’s because we don’t get the satire, liking the idea of a tough-guy enforcer instead of being scared by it. Regardless of the relatively small sales of the comic here, the concept is immediately striking, as shown by the kind of art that can be done with a faceless tough guy with a really big gun. Plus, there’s the whole dystopian future setting, with lots of darkness and grimy tech. Which may be why they keep trying to make a movie featuring the character. Lionsgate is releasing Dredd 3D on September 21. Here’s the short TV spot for it, which demonstrates how you can get the idea of the action movie across really quickly. It stars Karl Urban (Bones in the Star Trek relaunch) as Dredd, although since we should never see his face, that’s kind of hard for him. The plot involves him and the psychic Judge Anderson (Olivia Thirlby) trying to stop “a dangerous drug epidemic that has users of Slo-Mo experiencing reality at a fraction of its normal speed”. This longer trailer shows more of the plot … and attitude, with villain Ma-Ma played by Lena Headey (Game of Thrones).